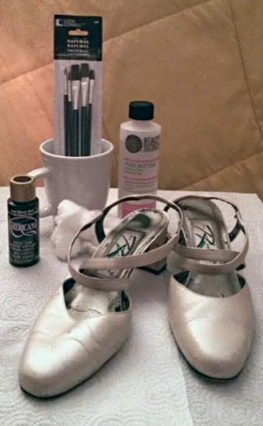 How To Paint Leather Shoes! 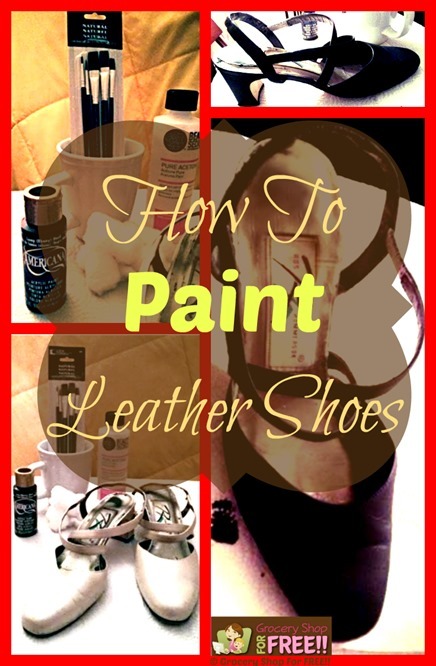 You are here: Home / DIY / How To Paint Leather Shoes! Have you ever painted leather shoes before? Or painted any kind of leather? I had no idea how to paint leather and never even thought of it! How To Paint Leather Shoes, Purse, etc. The key to painting leather or faux leather is in the prepping of the piece. It needs to be cleaned and thoroughly prepped. Acetone and/or Rubbing Alcohol will clean it well and help take the finish off to allow the paint to soak into the leather and become permanent. If you find the acetone/alcohol is not removing the finish well enough you can also use a fine grit sand paper. To begin you want to clean the piece using cotton balls and Acetone or Alcohol, scrub the piece down as well as you can. You want the leather dull not slick and shiny. If it’s real leather the Acetone and fine grit sand paper is your best bet, just clean the piece well with the Acetone then sand with the sandpaper just enough to rough it up a bit. If it’s a faux leather usually just acetone and/or alcohol will work just fine. The second thing you want to do is tape off any portion of the shoe you don’t want to paint. Now we can get started with the painting. You want to mix equal parts acrylic paint and water to paint with. I start with 1 tablespoon of each and believe it or not that’s usually enough to paint a pair of shoes, it doesn’t take that much. Once that’s mixed in your glass cup or bowl, just start painting. Also you want the piece to dry completely between each coat of paint. I used a blow dryer for this on the coolest setting and it takes maybe 1 minute to dry between coats. You can also follow these steps to freshen up the heels on your shoes that may have become scratched or scuffed. I have also used this process to touch up leather furniture too. There is no need to seal the paint because once acrylic paint dries, it becomes permanent. However if you prefer a more shiny look you can also purchase a glossy acrylic paint and apply it after the pieces are dry using 1 tablespoon of the glossy coat to 1 teaspoon of water. I purchased all the items needed (except acetone) from JoAnn’s Fabric and Craft Stores, they are my go to craft/project destination. They are always so helpful and courteous and the best part is they have a great app you can download that always has a 40 percent off coupon. Just show your phone and you’re good to go or you can go online and print them out. The coupons on the app can be used multiple times. I had cotton balls and a glass bowl at home already so I needed Acrylic Paint, Paint Brush and Acetone. The Acetone I purchased at Sally’s Beauty Supply for $1.79 but can be found at Walmart, Walgreens, CVS and most Dollar Stores. At JoAnn I checked out 2 separate times and received 40 percent off each item. The paint is $1.99-$3.99 depending on the brand, the one I purchased was $1.99. Paint brushes start at $1.99, the brush I purchased was $2.99. I didn’t use sandpaper this time because it was a faux leather and wasn’t needed however sandpaper can also be purchased from JoAnn. So after the supplies the total cost about $5.00! How are these shoes holding up so far? Any noticeable wear? I really find it hard to believe that the acrylic won’t wear off easily! I actually saw my granddaughter wearing them last night! They are her Mom’s, they looked cute – I remember commenting to my DD how good they looked!